Opt-In Comments is a new WordPress plugin from Ian Fernando that makes building your e-mail list a little bit easier. 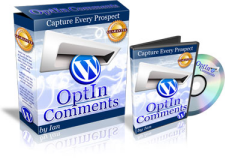 What Opt-In Comments does is allow visitors who leave a comment on your WordPress blog to opt-in to your e-mail list. How Can Opt-In Comments Make Me Money? What’s the difference between a normal opt-in form and Opt-In Comments?